The parking lot for your business can be a busy place. With both foot and vehicle traffic, you want to ensure that your patrons have a clear understanding and guidance of the flow to the parking area. To prevent chaos and confusion, it is important to ensure that proper instructions are available for people using the parking lot. One of the most convenient methods for doing so is by installing metal signage in the lot. Our crews are professionals when it comes to properly installing signs in your parking lot. Having our crews install your signage is a huge plus for several reasons. 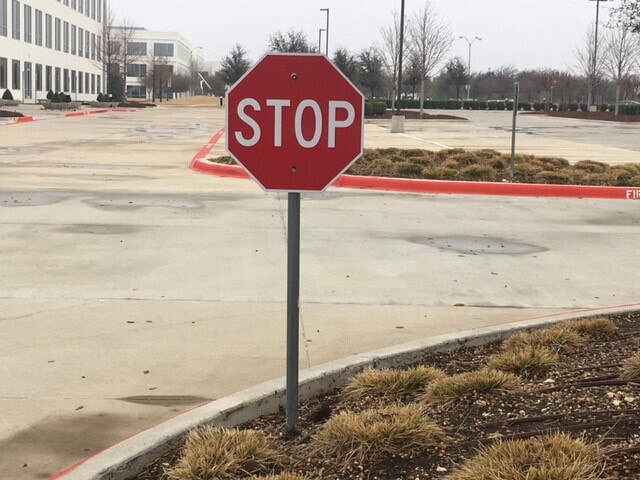 First you do not have to purchase the proper equipment to get the job done correctly, and secondly, you will ensure that your signs are installed properly and according to code. In the event, you prefer to install your own signs here are a few tips. The first step in installing the metal signage is coring, drilling holes in asphalt or concrete to set the signs. A drill bit for making a hole should be selected according to the thickness and density of the concrete. Older concrete is denser, so choosing a proper industrial strength bit to use is imperative as the drill bit of a conventional drill may break. Concrete which has been installed recently is not very dense, and a conventional rotary drill with a carbide tip should be adequate for coring, drilling the hole depending on the size of the poles used for fixing the metal signs.